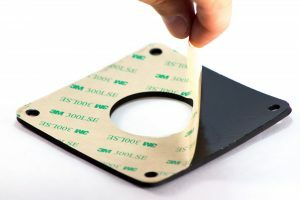 SRP provides adhesive backed services for customers who require their custom gaskets, seals, or strips to adhere to various substrates. 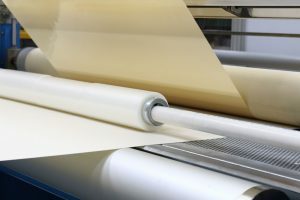 SRP specializes in technologies to laminate adhesive products to foam, sponge, rubber, cork, adhesive & non-adhesive tapes, textiles, and similar materials. We can combine single or multi-layer lamination, liner removal, slitting & rewinding in wide web or narrow widths, and sheeting. A Class 10,000 clean room environment is optional. SRP works with a wide variety of adhesives from suppliers such as 3M, Avery, CCT, and Adchem. If your company requires precision die cutting services, please do not hesitate to contact us at 847-593-5630 or email us at info@srpco.com. Click Here for more info on the many materials we commonly convert in our facilities.